West Bengal Government's Minister for Industries, Partha Chatterjee, has recently indicated through media that Cals Refineries Ltd won't be given any further extension beyond September of this year to complete financial closure (FC) of their long pending project. The language and tone used by Chatterjee was rather tough - “We have already given them an extension but will not do any longer as the project has already suffered many delays,” he said. Even more importantly, the minister indicated that "necessary actions" would be taken against the company, if it fails to achieve FC by September 2011. It should be recalled that Cals Refineries is enjoying various concessions from the West Bengal Government in the form of land, and various tax exemptions. But the timing and rationale behind this 'outburst' is somewhat confusing, due to some peculiar factors. For one, the latest Zero Date for the project, as announced by Cals, is October 1st 2011, which means that financial closure has to be complete at least by September, if not earlier. Secondly, West Bengal Government is well aware of the fact that Cals Refineries's FDI proposal for Rs. 1425 crore has been recommended by India's Foreign Investment Promotion Board (FIPB), and is now pending before the Cabinet Committee for Economic Affairs (CCEA), which has sometimes taken up to 6 months for giving approval to large projects. Cals Refineries resorted to this FDI, which involves issuing equity in the form of GDR to Vienna-based Hardt Group in lieu of two used refineries, as it required a significant equity expansion to attempt FC with various lending institutions. Though this will amount to significant dilution for existing investors, the rationale was that the dilution would be offset by the doubling in the refinery's capacity. 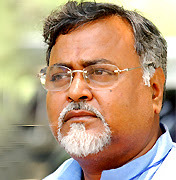 Partha Chatterjee is not the average politician-turned-minister either, to not know about these developments. The high-profile minister is an MBA and former executive of Kolkata-based Andrew Yule, an Indian Government enterprise, which is also into petrochemicals. Recently, Chatterjee, together with Chief Minister Mamata Banerjee, was instrumental in trying to revive the fortunes of Haldia Petrochemicals, which is a kind of public-private-participation (PPP) project. His tough stand on the issue is likely due to the pressure West Bengal is facing due to the relative non-performance of the Haldia based Petroleum, Chemicals, & Petrochemicals Investment Region (PCPIR). A PCPIR is a special scheme of Indian Government whereby different areas of the country are designated for development of petroleum and chemical industries. Each PCPIR will have one or two anchor tenants who will supply the feedstock for the hundreds of smaller, allied industries. Indian Oil Corporation (IOC) and Cals Refineries are the designated anchor tenants for the Haldia PCPIR. Evidently, the long delay in the implementation of Cals Refineries' Haldia project has affected the prospects of Haldia PCPIR. In contrast, the PCPIRs in other Indian states of Gujarat, Andhra Pradesh, Orissa, & Tamilnadu have made rapid progress in recent quarters, despite some of them getting CCEA approvals much after West Bengal's PCPIR at Haldia. If this is the reason behind the minister's outburst, it is more or less justified. Cals Refineries too would only benefit from this, as the relative slowness of the project would definitely benefit from some amount of healthy pressure. This is not the first time a deadline is being imposed on Cals. As StockExplain reported earlier, Germany's Bayernoil and the city of Ingolstadt had earlier asked Cals and its contractor Lohrmann to start taking possession of the refinery as soon as possible so that the land will be cleared for re-development by end of 2012. But if the minister's tough-talk is not due to PCPIR concerns, this development is somewhat more troubling for Cals, as the project is already suspected to have attracted some detractors at India's petroleum ministry, as well as co-anchor IOC, to whom CCEA has referred some queries on the feasibility of Cals' capacity expansion. It should be remembered that, when complete, Cals Refineries will be the country's third or fourth largest refinery, and as such, is sure to attract detractors. But the project has also found excellent support in India's Finance Ministry, headed by Pranab Mukherjee who hails from West Bengal, and under which FIPB functions, and which was very prompt in recommending Cals' proposed FDI to CCEA, by overruling objections by petroleum and revenue departments. Cals Refineries is understood to have already taken up the issue with West Bengal's Chief Minister, Mamata Banerjee. In any case, if the CCEA approval is obtained without much delay, the only lasting effect of West Bengal's new stand would be that the lending institutions with which Cals has been discussing FC are likely to get an upper hand in the negotiations, due to the impending deadline. The Cals Refineries scrip, listed at BSE, had soared by almost 100% - from Rs. 0.31 to Rs. 0.63 - during the last seven weeks. The scrip had touched its 52-Week High yesterday and today, though it is now trading in red due to the nervousness arising from West Bengal's stand, as well as the much due correction after the steep climb up. The first leg of this rally, to Rs. 0.42, was powered by the news of FIPB approval and the final dismantling of Cals-owned Bayernoil Refinery of Ingolstadt, Germany, whereas the second phase to Rs. 0.63 was largely powered by Cals Refineries' latest Share Holding Pattern (SHP) that revealed that apart from Hardt Group's entry and promoters' upping their stake, over 1 crore shares were bought by some Foreign Institutional Investors (FIIs) during the last quarter. However, the stunning rally was not without its negative points. At least one brokerage which is quite active in pennystocks like Cals, resorted to some high-volume smart trading that drove up volumes and prices. The techniques employed were buying and selling huge volumes at same prices, sometimes at slightly favourable prices, and sometimes even at apparently unfavourable prices. While many retail investors are unaware of these strategies, it works out handsomely for such brokerages as they already have huge holdings at low average prices, and these techniques are employed only to drive up prices and volumes to cushion huge sells. But this phenomenon is something Cals Refineries and its investors have to live with for the present, as the stock had plunged from great heights and loitered without hope for many years, thereby attracting these kind of operators. Most pennystocks that later went on to become mainstream scrips had to neutralize such attacks in their flight forward, and this become easy once institutional investors enter and make larger sized buys for longer durations. For Cals Refineries, such momentum will happen after each crucial milestones like CCEA approval, GDR to Hardt, investment by Kuwait's Kharafi Group, and financial closure. The analysis though very good does show clarity as to weather the refinery plans will work out or not. If CCEA takes 6 mths, then there will be more problems as the German authorities want to take over the plant site for stadium in a short time from now. In that case what?? To many questions ,too little answers.